This is by far my favorite read out of Classics Month so far! It's a little cheesy, but cheese is one of the few things in life that has never bothered me. And it's also full of romance, and adventure, and a smart hero--I didn't want to put it down! Rudolph Rassendyll is a lazy second son of a noble family, and he carries the coloring of a scandal in the Rassendylls' past--when one of their ancestors had an infamous affair with the Prince of Ruritania (a small country somewhere beyond Germany). Well, of course Rudolph takes it into his head to visit Ruritania; and of course when he does, he becomes embroiled with his distant relatives. Throughout the book, two questions keep you reading: will Rudolph remain in Ruritania? And will he and Princess Flavia get together? This is a really fun book I can honestly say I'd recommend to anyone. It's very romantic, in the traditional literary sense; completely and utterly ridiculous; charming; and at once full of adventure and Victorian subtleness. Plus, it has probably one of the best villians I've ever come across in a book--Rupert Hentzau, who is just absolutely fascinating (fortunately Hope did write a sequel about him, which I have already downloaded). Despite its short length (less than 200 pages), it makes you care about the characters and the outcome of Rudolf's adventure. 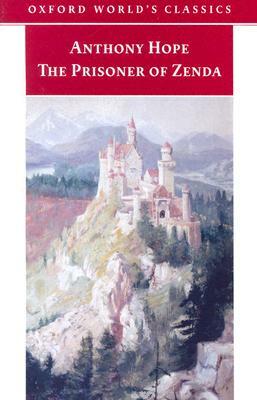 My favorite part of the novel, of course, was the romance between Flavia and Rudolf (although the entire book could really be called a romance). It's a love-at-first-sight, Arthurian-type romance that I didn't expect to work at all--but somehow it does. And the ending is simply delicious, even if it wasn't the conclusion I was hoping for. You seriously need to give this book a try. You can download it for free, and it's a total blast from start to finish. Like I said, my purpose in life now is make EVERYONE read this. I read this for The Society for Exploratory Action in Literature, a book group on GoodReads that focuses on 19th-century literature.